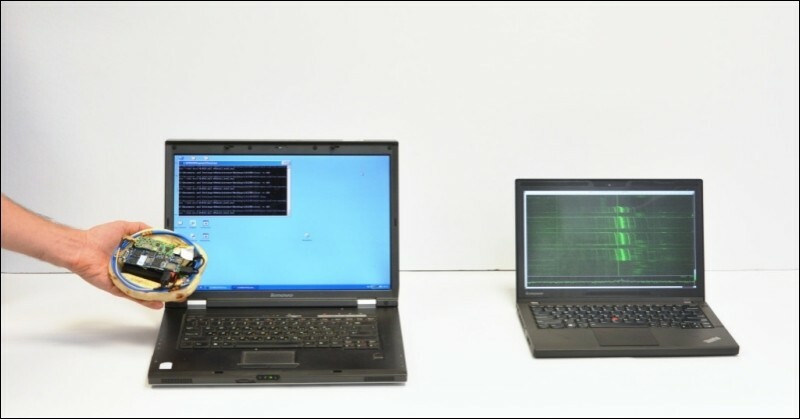 Researchers at Tel Aviv University and Israel’s Technion research institute have developed a device capable of wirelessly stealing data from nearby notebooks. The palm-sized gadget doesn’t hijack Wi-Fi or Bluetooth signals; instead, it captures the stray radio waves emitted by a system’s processor. The spy device, which cost less than $300 to build using readily available components, can work at a range of up to 19 inches away. The researchers are calling it the Portable Instrument for Trace Acquisition, or PITA, as the machine is small enough to fit inside a piece of pita bread. Once information is snatched out of the air, it can be stored locally on an SD card or beamed back to the eavesdropper via Wi-Fi. It’s so discrete that targets likely would never know their computer has been compromised. While the technology may sound cutting-edge, scientists have known for decades that computers leak sensitive information in the form of radio waves. Back in 1985, Dutch security researcher Wim van Eck was able to pick up radio waves from a CRT monitor and use the data to reconstruct onscreen images. Similar tactics were used by German and Iranian researchers in 2008 to gather data from wireless key fobs in order to unlock garage doors and even cars. The full research paper, Stealing Keys from PCs using a Radio: Cheap Electromagnetic Attacks on Windowed Exponentiation, is being presented at the Workshop on Cryptographic Hardware and Embedded Systems in September.